Pink, Olive 1930 , Olive Pink Collection. 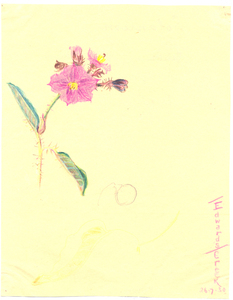 Coloured pencil on paper sketched by Olive Pink at Edwards Creek, South Australia, 26/7/30. Identified by Olive pink as Solanum helipticum (ellipticum) , University of Tasmania Library, Special & Rare Materials Collections, Hobart. Coloured pencil on paper sketched by Olive Pink at Edwards Creek, South Australia, 26/7/30. Identified by Olive pink as Solanum helipticum (ellipticum). (Dimensions 19x24.5cm)(File no. p6-3-14).